There is an imperative necessity for alternative sources of energy able to reduce the world dependence of fossil oil. One of the most successful options is ethanol obtained mainly from sugarcane and corn fermentation. The foremost residue from sugarcane industry is the bagasse, a rich lignocellulosic raw material uses for the production of ethanol second generation (2G). New cellulolytic and hemicellulytic enzymes are needed, in order to optimize the degradation of bagasse and production of ethanol 2G. The ability to produce hemicellulases and related enzymes, suitable for lignocellulosic biomass deconstruction, was explored using 110 endophytic fungi and 9 fungi isolated from spoiled books in Brazil. Two initial selections were performed, one employing the esculin gel diffusion assay, and the other by culturing on agar plate media with beechwood xylan and liquor from the hydrothermal pretreatment of sugar cane bagasse. A total of 56 isolates were then grown at 29°C on steam-exploded delignified sugar cane bagasse (DEB) plus soybean bran (SB) (3:1), with measurement of the xylanase, pectinase, β-glucosidase, CMCase, and FPase activities. Twelve strains were selected, and their enzyme extracts were assessed using different substrates. Finally, the best six strains were grown under xylan and pectin, and several glycohydrolases activities were also assessed. These strains were identified morphologically and by sequencing the internal transcribed spacer (ITS) regions and the partial β-tubulin gene (BT2). The best six strains were identified as Aspergillus niger DR02, Trichoderma atroviride DR17 and DR19, Alternaria sp. DR45, Annulohypoxylon stigyum DR47 and Talaromyces wortmannii DR49. These strains produced glycohydrolases with different profiles, and production was highly influenced by the carbon sources in the media. The selected endophytic fungi Aspergillus niger DR02, Trichoderma atroviride DR17 and DR19, Alternaria sp. DR45, Annulohypoxylon stigyum DR47 and Talaromyces wortmannii DR49 are excellent producers of hydrolytic enzymes to be used as part of blends to decompose sugarcane biomass at industrial level. In nature, lignocellulosic materials are degraded by a consortium of microorganisms that synthesize many hydrolytic enzymes able to loosen and degrade these substrates. Improvement in the efficiency of hydrolysis of lignocellulosic materials has traditionally focused on cellulose, which is the most abundant plant polysaccharide . However, the presence of hemicellulose and lignin can restrict cellulose hydrolysis. The hemicellulases, such as pectinases and xylanases, stimulate cellulose hydrolysis by removal of the non-cellulosic polysaccharides that coat the cellulose fibers . Cellulolytic and hemicellulolytic enzymes have been extensively investigated as tools to achieve viable second-generation ethanol production. The hemicellulases include accessory enzymes, which are a group of enzymes capable of increasing the yield of reducing sugars during enzymatic hydrolysis of lignocellulosic substrates. The definition of the accessory enzymes has evolved over time. Enzymes such as the β-glucosidases were originally classified as accessories, but today are considered essential in enzymatic cocktails, following elucidation of their mechanisms of action during substrate degradation [2–4]. The main accessory enzymes are currently considered to be α-L-arabinofuronosidase, hemicellulolytic esterases, β-mannanases, α-glucoronidases, β-xylosidases, pectinases, and xylanases. Several studies have shown that cellulase enzymes supplementation can improve the enzymatic hydrolysis of lignocellulosic biomass, in terms of speed and hydrolysis yield. An issue is that crude multi-enzyme blends obtained from a single fungus strain are not ideal in biotechnological applications. This is because cellulase activities are not expressed at sufficient levels, or the enzyme complexes are not well balanced in terms of the individual enzymes . For this reason, fungi strains isolated from unusual environments have been sought as alternative sources of hydrolytic enzymes [5, 6]. Endophytic fungi are potentially amongst the most interesting microorganisms for screening for the production of industrial biocompounds. These microorganisms are ubiquitous in plants, inhabiting plant tissues without inducing any apparent symptoms in their hosts . The fact that these microorganisms are present within plant tissues could explain their capacity to produce substances that could have useful industrial, agricultural, and medicinal applications . The endophytic fungi that have been reported to be xylanase producers include Alternaria alternata, Hymenoscyphus ericae, and Aspergillus terreus. De Almeida et al. selected strains from the Acremonium endophyte species for hemicellulases and cellulases production. From 14 plant species, Suto et al. isolated 155 strains of fungi that produced xylanases. Harnpicharnchai et al. purified a thermotolerant β-glucosidase from an endophytic Periconia sp. Other studies have involved the selection of new isolates using extracellular enzymes as selection parameters for plant growth promotion. Silva et al. investigated fungi isolated from Annona spp., while Luz et al. employed isolates from Passiflora edulis. Endophytic fungal strains may therefore constitute a valuable source of biological material that deserves to be studied and explored for the production of cellulolytic and hemicellulolytic enzymes. In this context, the present work concerns the selection of endophytic fungi as producers of hemicellulases and related enzymes with different enzymatic profiles, for use in the deconstruction of lignocellulosic biomass. The sugar cane hydrothermal pretreatment liquor showed the following composition (g/L): xylo-oligosaccharides (9.98), xylose (4.70), glucose (0.55), arabinose (0.77), cellobiose (0.0), furfural (1.05), hydroxymethylfurfural (0.18), acetic acid (1.47), formic acid (0.23), and total soluble lignin (3.15). Despite the presence of inhibitors, this liquor demonstrated to be a potential carbon source for the screening of enzyme producers and the production of hemicellulases. The DEB was composed of 77.89% cellulose, 7.09% hemicellulose, and 16.22% lignin. The SB consisted of 34% cellulose, 18.13% hemicellulose, 9.78% lignin, and 43.22% protein. The media prepared using these waste materials were therefore able to provide a suitable ratio of cellulose and hemicellulose for the synthesis of glycohydrolases, as well as a good source of nitrogen. A total of 120 fungal strains were bioprospected and used for calculation of hydrolysis rates (Additional file 1: Table S1). The media containing liquor were stained with Congo Red, revealing the yellow hydrolysis halos (Figure 1). A total of 73 strains were unable to grow on the medium, while only 35 were able to both grow and produce halos. On the other hand, in the case of the medium with xylan, only two strains, one Aspergillus sp. and one Diaphorte sp. were unable to grow, while 102 strains grew and produced halos. It was therefore demonstrated that the xylose/xylo-oligomers liquor produced by a simple pretreatment was able to sustain the growth of a significant number of the fungi tested. Hydrolysis results following staining with Congo Red, using xylan agar (A, B, and C) and liquor agar (D, E, and F). The organisms used were Penicillium sp. DR65 (A, D), Aspergillus sp. DR06 (B, E), and Fusarium sp. DR15 (C, F). Selection of β-glucosidase producers employed the EGDA to determine β-glucosidase in the fungal culture extracts, with positive extracts forming dark-colored halos. Of the 119 extracts tested, 63 produced measurable halos, 27 showed dark precipitates although measurement was not possible, and 40 strains were negative for β-glucosidase production. The plate screening and EGDA results were used to select 56 strains for a second screening employing shake flask cultivations. Some of these strains were negative in the hemicellulolytic and β-glucosidase tests, and were used as controls to ensure selection consistency. The strains were grown using DEB + SB (3:1) at 29°C on a rotary shaker at 200 rpm for 96 h. The results obtained for some of the strains are presented in Figure 2. Low β-glucosidase activities were detected up to 48 h of fermentation, while high activity levels were observed at 96 h. This was expected, since several filamentous fungi are known to begin to produce detectable amounts of this enzyme after 72 h of growth . 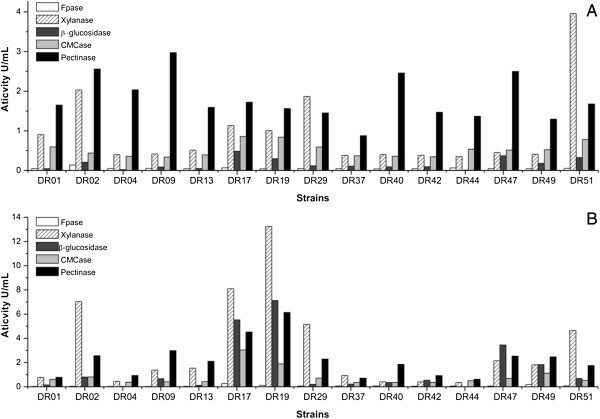 Enzymatic activities of some pre-selected strains, grown in shake flasks with DEB + SB (3:1), after 48 h (A) and 96 h (B). The CMCase and FPase activities were low for all the strains, as expected because selection was performed using materials rich in hemicelluloses. High xylanase production was detected at 48 h for many strains, but the largest peaks occurred at 96 h. Pectinase production showed little variation between 48 and 96 h, although amounts of the enzyme nonetheless increased over the course of the fermentation. Strains morphologically similar to Aspergillus fumigatus (DR08, DR03, DR29, and DR31) were excluded due to possible pathogenicity, which could preclude their use in industrial applications. In order to identify fungi that produced enzyme with different profiles, and hence obtain a more efficient enzymatic extract, 12 strains were selected according to their morphology and enzymatic profiles. A new fermentation with DEB + SB was performed, and samples were taken daily for measurement of xylanase, β-glucosidase, and pectinase activities. The samples that showed the highest glycohydrolase activity were tested using different substrates (Table 1). The strains DR17 and DR19 (Trichoderma sp. ), and DR02 (Aspergillus sp.) presented the highest xylanolytic activities for birchwood xylan, beechwood xylan, and rye arabinoxylan. Despite the fact that the strains DR17 and DR19 belong to the same genus, and have similar morphologies, they presented different enzymatic profiles (Table 1). Selection was made of six strains (DR02, DR17, DR19, DR40, DR47, and DR49) that showed enzymatic activities for a wider range of substrates, were morphologically different, and presented distinct enzymatic profiles. These strains were cultured in shake flasks containing xylan and pectin as inducer carbon sources. Samples were taken daily for measurements of xylanase, β-glucosidase, and pectinase activities. The fungal extracts that showed highest glycohydrolase activities were tested using different substrates (Table 2). The fungi xylanolytic profiles differed among the strains and the carbon sources used. The DR17 strain produced xylanases with the same affinity for birchwood xylan, beechwood xylan, and rye arabinoxylan, when cultivated in the presence of beechwood xylan. However, this was not observed when the same Trichoderma sp. was grown using DEB + SB. Some strains showed higher activity for beechwood xylan than for birchwood xylan (DR49 and DR40), and vice versa (DR02). The DR02 strain showed the highest activity for rye arabinoxylan. The DR40 strain only produced xylanase when the fungus was grown in the presence of xylan, in contrast to other strains such as DR19, DR49, and DR17, for which DEB and SB also induced the production of xylanases. The production of β-glucanases was high for DR02 and DR40 strains when cultivated on xylan, for DR17 when grown on DEB + SB, and for DR49 on pectin. However, when these extracts were tested using xyloglucan, all the activities decreased, indicating less affinity for the hydrolysis of β-glucan with branched xylose residues. A similar phenomenon occurred in the testing of lichenan, which is a linear glucan with more β-1,3 bonds than β-glucan. This indicates that the β-glucanases present in these extracts had lower lichenanase activity. Furthermore, when the DR40 and DR49 strains were grown on xylan, they showed activity against laminarin, indicating the presence of enzymes able to hydrolyze the β-D-glucosyl (1→6) β-D-glucose bond. For almost all fungi, with the exception of DR02 and DR49, the production of polygalacturonase was only induced in the presence of pectin. The best producers were the strains DR47 (7.72 U/mL) and DR17 (5.09 U/mL). The production of β-glucosidase showed no consistent induction pattern for the three carbon sources tested. DR17 and DR47 produced more β-glucosidase on DEB + SB, while DR02 produced more on pectin, and DR49 on xylan. None of the fungi showed measurable activities for β-1,4-D-glucosaminidase or α-mannosidase. When the Talaromyces sp. DR49 strain was grown on xylan, it was able to produce multiple accessory proteins such as xylosidase, arabinofuranosidase, cellobiohydrolase II, and β-glucosidase. This strain might therefore be promising for the production of hemicellulases. High CMCase activity was measured when this fungus was cultivated on xylan, but it did not present high activities against β-glucan. However, opposite result was found when this strain was grown on DEB + SB. The hydrolytic action of the fungal extracts against mannan polymers was low for all the strains. Nevertheless, activities for heteromannans (glucomannan and galactomannan) were higher than for β-1,4-mannan. This could be explained by the presence of β-(1→4)-glucanase activity in the extracts in the case of glucomannan, and the presence of α-1,6-galactosidase in the case of galactomannan. Strain identification was performed using morphological characteristics as well as sequencing of the ITS regions of the ribosomal DNA gene and (in some cases) the partial β-tubulin gene. The best xylanase producer strain, DR02, previously isolated from Platanus orientalis, was identified according to morphology (rough dark brown conidia, spherical vesicles and biseriate conidiophores) as Aspergillus section Nigri. The ITS regions and partial BT2 sequencing were performed and submitted to GenBank (accession number KC311839, KC311845). The phylogenetic trees, built with reference strains of Aspergillus Nigri section species, showed that the DR02 isolate clustered with A. niger (Figure 3). Higher value of A. niger BT2 clustering confirm the ITS result, the strain DR02 belongs to the Aspergillus niger species. Phylogenetic tree of Aspergillus section Nigri based on confidently ITS (A) and partial BT2 (B) sequences constructed with Neighbor-joining implemented in MEGA 4.0.2. Bootstrap values > 80 from 100 resampled datasets are shown with branches in bold. Strains in bold indicate isolates of this study. The DR47 strain, which is a good pectinase and β-glucosidase producer, did not present reproductive structures under the microculture technique. As the classical methods did not lead to conclusive results, sequencing of the rDNA ITS regions was performed (GenBank accession number KC311843). The blast alignment suggested that the DR47 isolate belonged to the Annulohypoxylon stygium species (EU272517, with 99% similarity). A separation of two groups in the ITS tree constructed with Annulohypoxylon and related species was found. One group revealed that the DR47 isolated clustered with A. stygium and Annulohypoxylon urceolatum, but was closer to A. stygium. The second group consisted on Annuhypoxylon spp. and Hypoxylon investiens (Figure 4A). Sánchez-Ballesteros et al. analyzed the ITS1-5.8S-ITS region, and found that Annulohypoxylon spp. cluster inter-mingled with species of the genus Hypoxylon section Hypoxylon. Therefore, sequencing of partial BT2 was also performed (GenBank accession number KC311846) as suggested by Hsieh et al. . The phylogenetic tree was built and the DR47 isolated was clustered with A. stygium species, with a high bootstrap value, and was closer to A. stygium than to Annulohypoxylon stygium var. annulatum (Figure 4B). Besides, H. investiens was consistently separated from Annulohypoxylon. Phylogenetic tree of Annulohypoxylon and related species based on confidently ITS (A) and partial BT2 (B) sequences constructed with Neighbor-joining implemented in MEGA 4.0.2. Bootstrap values > 80 from 100 resampled datasets are shown with branches in bold. Strains in bold indicate isolates of this study. The DR49 strain, previously isolated from spoiled books, was identified as Talaromyces sp. The Blast alignment of the ITS regions (GenBank accession number KC311844) and partial BT2 (GenBank accession number KC311847) sequences suggest similarity with to Talaromyces wortmanni. The trees based on ITS and BT2 sequencing built with close related Talaromyces spp. corroborated with the blast aligned. The Talaromyces sp. DR49 strain was clustered with Talaromyces wortmannii with high bootstrap values in both trees (Figure 5). Phylogenetic tree of Talaromyces and close related species based on confidently ITS (A) and partial BT2 (B) sequences constructed with Neighbor-joining implemented in MEGA 4.0.2. Bootstrap values > 80 from 100 resampled datasets are shown with branches in bold. Strains in bold indicate isolates of this study. The DR40 strain, isolated from E. benthamii, was previous identified by macro and micro morphology as Alternaria sp. The sequencing of rDNA ITS (GenBank accession number KC311842), suggested that the DR40 isolate belonged to the Alternaria alternata species (JQ320281, with 100% similarity) while no amplicon of the BT2 gene was obtained for this strain. The tree based on rDNA ITS sequencing built with correlated species showed no resolution among the strains of the alternata species group (Figure 6A). Previous work has also found no genetic variation between the small-spored Alternaria species in ITS sequences [20, 21]. According to Andrew et al. , taxonomical differentiation of the small-spored species within the alternata group is difficult, not only because there are few distinguishing morphological characteristics, but also because these characteristics are strongly influenced by the environment. Moreover, the same authors could not solve Alternaria spp. that belongs to the alternata group using a phylogenic multilocus approach. Phylogenetic tree of Alternaria (A) and Trichoderma (B) species based on confidently ITS sequences constructed with Neighbor-joining implemented in MEGA 4.0.2. Bootstrap values > 80 from 100 resampled datasets are shown with branches in bold. Strains in bold indicate isolates of this study. The DR17 and DR19 strains were also endophytic isolates from E. benthamii, and were morphologically identified as Trichoderma sp. The ITS1-5,8S-ITS2 sequences for Trichoderma sp. DR17 and Trichoderma sp. DR19 (GenBank accession numbers (KC311840, KC31184) aligned with the database Trichoderma atroviride strain DAOM 179514 with 100% similarity (EU280125). The tree based on rDNA ITS sequencing (Figure 6B) formed two groups, and the DR17 and DR19 isolates were clustered with the Viride clade (T. atroviride, Hypocrea koningii and Hypocrea viridescens), and were closer to the T. atroviride species. High activity, good stability, and low cost are key requirements of enzymes employed for large-scale hydrolysis of lignocellulosic biomass into sugar. Agro-industrial wastes can be useful materials for enzyme development, improvement, and production. The liquor derived from sugar cane bagasse hydrothermal pretreatment is a low cost feedstock  rich in xylose and xylo-oligosaccharides which are capable of inducing the expression of xylanases and accessory proteins in fungi such as A. niger. Other materials, such as steam-exploded delignified bagasse and soybean bran, have also been used as inexpensive culture media to achieve high xylanase, cellulase, and β-glucosidase activities employing Trichoderma harzianum P49P11 . The full hydrolysis of lignocellulosic biomass requires several types of glycohydrolases that enable the release of saccharides and other compounds from the recalcitrant substrate. However, plant species are highly diverse in terms of cell wall structure and composition, which increases the attraction of formulating specific biomass-degrading enzymatic cocktails. The sugar cane cell wall polysaccharide is mainly composed of xyloglucan and arabinoxylan, closely associated with cellulose, as well as pectin, β-glucan and less branched xylan strongly bound to cellulose . Several studies have shown that supplementing cellulases with other enzymes can assist in the enzymatic hydrolysis of lignocellulosic biomass. Xylanases and β-xylosidases improved the hydrolysis yield when combined with cellulases and β-glucosidades [27–29]. The addition of pectinase to Celluclast 1.5 L increased the hydrolysis of pretreated corn stover . Supplementation of cellulolytic cocktails with α-L-arabinofuranosidase and xylanase also showed a synergistic effect in the hydrolysis of wheat straw . The production of glycohydrolases is closely related to the nature of the carbon source, since fungal metabolism is greatly influenced by the composition of the medium (which also hampers the screening of strains). Each strain has a distinct metabolic profile, while the enzymatic profile is also distinct and depends on the medium and the cultivation time (Table 1). Physiological variations are the result of the adaptation and evolution of fungi, considering their hosts, original habitats, and other factors. The strain A. stigyum DR47 belongs to the Xylariaceae family, members of which are frequently encountered as endophytes and saprophytes . Gazis & Chaverri  isolated several endophytic Xylariaceae strains and one strain of Annulohypoxylon sp. from Hevea brasiliensis. Wei et al. cultivated an A. stigyum strain on Avicel and confirmed the production of β-glucosidase, although only low levels of cellulases were detected. Most Alternaria species are saprophytes commonly found in soil or on decaying plant tissues, and some species are opportunistic plant pathogens . However, endophytic strains of Alternaria spp. have been isolated from eucalyptus plants such as Eucalyptus globulus and Eucalyptus citriodora. Strains of A. alternata are able to produce endopolygalactunorase  in the presence of pectin, and β-glucosidase in the presence of saccharose . A. niger is known worldwide for its ability to produce an extensive range of extracellular glucohydrolases, including xylanases, pectinases, and β-glucosidase . This characteristic is associated with the ability of the fungus to propagate and colonize a variety of environments, principally those rich in decomposing plant materials . The fungus was recently reported to be endophytic in several plant species [41, 42]. However, this work is the first report of A. niger as an endophytic fungus in P. orientalis. There have been no previous reports in Brazil concerning T. wortmannii isolated from decaying materials. Jang et al. first described β-xylosidase activity in a T. wortmannii strain previously isolated from Japanese red pine and larch woods in Korea . Jang et al. obtained a β-xylosidase production of 3.82 U/mL for cultivation on xylan, in good agreement with the β-xylosidase activity (2.85 U/mL) found in the present work for the DR49 strain grown on xylan. Trichoderma spp. are present in soil as saprophytes, and have also been found as endophytic organisms . Many species from this genus are good cellulase and xylanase producers, such as T. harzianum and T. reesei[46–48]. T. atroviride strains are good producers of these glycohydrolases, and can produce high amounts of β-glucosidase . Microorganisms play an essential role in the degradation of cellulose and hemicellulose standing out the endophytic fungi which are excellent sources of hydrolytic enzymes. Evidently, during the endophytic phase, the use of these enzymes must be related to the mutualistic relationship with the host plant . However, although the association between plants and endophytic fungi is ecologically important, little is known about the physiological characteristics of the interaction. An important aspect of enzymatic studies involving endophytic fungi is the involvement of these microorganisms in the decomposition of plant material [50, 51]. Since the fungi are already present in the senescent plant tissues, they may be able to initiate the decomposition process before it becomes dominated by saprophytic species. This could suggest not only that the production of hydrolytic enzymes by endophytic species might be important for the nutrition of the fungus during the endophytic stage, but also that these enzymes are produced and secreted at the surface of the tissues, where they can compete for the substrate during the saprophytic stage. Kumaresan & Suryanarayanan  investigated the ability of endophytic fungi from mangrove leaves of different ages to produce hydrolytic enzymes. It was found that endophytic species occurring at relatively low levels in living leaves were more prevalent after leaf fall, increasing the involvement of these fungi in decomposition of the plant material. An important consideration is the range of substrates that can be utilized by endophytic microorganisms. Studies have shown that endophytes are capable of metabolizing in vitro most substrates found in plants, and produce enzymes including proteases, amylases, phenol oxidases, lipases, laccases, polyphenol oxidases, cellulases, mannanases, xylanases, and pectin lyase [53, 54]. The balanced use of microbial enzymes in biomass deconstruction required the understanding of the role played by these glycohydrolases, and also depends on an economic process development. Therefore, biochemical characterization of new reported glycohydrolases producer strains, as well as a bioprocess development of the selected strains in large scale, must be conducted to evaluate the enzyme applicability on the biomass deconstruction, principally on sugar cane bagasse. The present work demonstrated that it is possible to select endophytic fungal strains that can produce glycohydrolases with activities against a wide range of target substrates. This will enable the future formulation of specific enzymatic cocktails for an efficient biomass deconstruction. Hemicellulase bioprospection was performed using a fungus culture collection maintained at the Microbiology and Molecular Biology Laboratory of the Federal University of Paraná (LabMicro/UFPR). A total of 119 Brazilian filamentous fungi were selected, previously isolated from Eucalyptus benthamii, Platanus orientalis, Glycine max, Solanum tuberosum, Saccharum officinarum, and decaying paper. A strain of Aspergillus niger ATCC 64973 was used as a positive control in plate assays. The strains were stored on potato dextrose agar (PDA) slants at 4°C. The liquor used was derived from the hydrothermal pretreatment of sugar cane bagasse in a reactor (Parr Model 4554, 7.5 L), using 10% (w/w) bagasse, a temperature of 190°C for 10 min, and a 1 h heating gradient. The liquor composition was determined by acid hydrolysis and HPLC . Total soluble lignin was determined by the method described by Gouveia et al. . The sugar cane bagasse was obtained from a local mill (Usina Vale do Rosário, Orlândia, SP, Brazil), and was prepared and characterized by Rocha et al. . The soybean bran (SB) was obtained from Agricola (São Carlos, Brazil) and was characterized by Rodriguez-Zuniga et al. . The selection of hemicellulolytic strains was performed by cultivation on solid medium as described by Kasana et al. containing 0.2% beechwood xylan (Sigma) or aqueous liquor diluted in deionized water at a volume ratio of 25%. The strains were first grown on malt extract agar (MEA) for 5 days at 29°C, and then inoculated onto the test media and incubated for 72 h at 29°C. The pH was adjusted to 5.0, and 0.1% Triton X-100 (Merck) was added as a colony growth limiter. The hydrolysis halos were revealed by application of Congo Red (1%) for 15 min, followed by washing with 1 M NaCl for 10 min . The hydrolysis rates were calculated by dividing the diameters of the hydrolysis halos by the diameters of the colony halos. The strains were grown for 5 days in liquid medium  with carboxymethylcellulose (CMC, 1%) as sole carbon source, in 10 mL tubes (pH 5.0, 200 rpm, 29°C). The biomass was separated by centrifugation, and the extract was subjected to an esculin gel diffusion assay (EGDA), as described by Saqib & Whitney , for 5 h at 37°C. The plate was then placed on ice, and measurement was made of the dark brown zone formed by the action of β-glucosidase on esculin. The composition of the main culture medium was adapted from Mandels & Weber , using 10 g/L of pretreated delignified sugar cane bagasse (DEB) plus SB, at a 3:1 ratio . 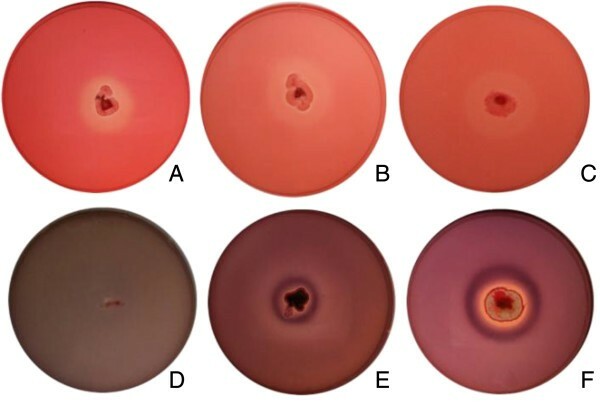 The 56 previously selected fungal strains were grown on PDA for 3 days at 29°C, after which one 0.5 cm diameter disc was removed from each colony edge, transferred to an Erlenmeyer flask containing 20 mL of medium, and incubated for 144 h at 29°C and 200 rpm. The best six strains were selected for growth using the same medium described above, but with the carbon source changed to citrus pectin or beechwood xylan. Samples were removed for determination of enzyme activities and protein contents, as described below. Measurement of enzymatic activities (in International Units, IU) was performed using different substrates in order to determine global and single activities. Filter paper activity (FPase) was determined as described by Xiao et al. . All the polysaccharides were purchased from Sigma Aldrich or Megazyme, and were assayed at 0.5% in a 10 min reaction. The polysaccharides used were: Beechwood xylan; Birchwood xylan; Rye arabinoxylan; Wheat arabinoxylan; Sugar beet arabinan; CMC; Barley β-glucan; Tamarind xyloglucan; Icelandic moss lichenan; Laminarin from Laminaria digitata; Chitosan from shrimp shells; Konjac glucomannan; Carob galactomannan; 1,4 β-mannan and citrus pectin. CMC was assayed in a 30 min reaction. The enzymatic activity was determined from the amount of reducing sugars released from the different polysaccharide substrates, using the DNS method  with glucose as standard. The activities of β-glucosidase, β-xylosidase, β-mannosidase, α-L-arabinofuranosidase, and cellobiohydrolase II were measured using the respective p-nitrophenol residues (pNP) (Sigma-Aldrich, USA). The assays employed 10 μL of diluted centrifugation supernatant and 90 μL of the respective pNP (0.5 mM, diluted in citrate buffer), and the mixtures were incubated for 10 min at 50°C. The reactions were stopped by adding 100 μL of 1 M Na2CO3, and the absorbance was measured at 400 nm using a Tecan Infinite® 200 instrument (Männedorf, Switzerland). All the assays utilized an epMotion® 5075 automated pipetting system (Eppendorf) and were performed at pH 5,0 with 50 mM citrate buffer. One unit of glycohydrolases activity corresponds to 1 μmol of glucose or pNP released per minute. Initial fungus identification was performed using macro and micro morphological characteristics [64–66]. The analysis of fungal reproductive structures by optical microscopy was carried out as described by Kern & Blevins . An approximately 1 cm2 colony of 5-day-old cultures was transferred to a 2 mL Eppendorf tube containing 300 μL CTAB (cetyltrimethylammonium bromide) buffer (2% (w/v) CTAB, 1.4 M NaCl, 100 mM Tris–HCl, pH 8.0, 20 mM EDTA, and 0.2% (v/v) β-mercaptoethanol) and about 80 mg of a 2:1 (w/w) mixture of silica gel H (Merck) and Celite™ 545 (Macherey Nagel & Co). The cells were disrupted manually with a sterile pestle for about 5 min. Subsequently, 200 μL CTAB buffer was added, and the mixture was vortexed and then incubated for 10 min at 65°C. After the addition of 500 μL chloroform, the solution was mixed and centrifuged for 5 min at 20,500 × g. The supernatant was transferred to a new tube, together with 2 volumes of ice-cold 96% ethanol. The DNA was allowed to precipitate for 30 min at -20°C, after which centrifugation was performed for 5 min at 20,500 × g. After washing with cold 70% ethanol and drying at room temperature, the pellet was resuspended in 97.5 μL TE buffer together with 2.5 μL RNAse (20 U/mL), and incubated for 5 min at 37°C, before storage at -20°C . The rDNA Internal Transcribed Spacer (ITS) region was amplified using ITS5 and ITS4 primers . Partial β-tubulin (BT2) gene was amplified using Bt2a and Bt2b primers . The sequencing of β-tubulin gene was performed for some strains to confirm the ITS phylogeny clustering. Amplicons were cleaned with a GFX™ PCR DNA purification kit (GE Healthcare, UK). Sequencing was performed on an ABI 3130 automatic sequencer (Applied Biosystems). The Staden sequence analysis package (v. 1.6.0) was used to edit and align the sequences . Sequence analysis was performed using BLASTn sequence alignment software, run against the NCBI (National Center for Biotechnology Information) database. The phylogenetic trees were constructed with 1000 bootstrap replicates using MEGA v4.0.2 software , with application of the neighbor-joining method , the Jukes-Cantor distance correction model . The nucleotide sequences used in this study were obtained/submitted to GenBank (Additional file 1: Table S2). The authors thank Fundação de Amparo à Pesquisa do Estado de São Paulo (FAPESP) and Conselho Nacional de Desenvolvimento Científico e Tecnológico (CNPq) for financial support, and the National Laboratory of Science and Technology of Bioethanol (CTBE) for technical assistance. JGP is employed at CTBE; GP at USP, ICP and VAV at UFPR; CMM, PSD, PSC and DR are M.Sc and Ph.D students respectively; JDR posdoctoral at USP. GP, JGP, JDR, DR conceived the study and wrote the paper; DR, CMM, PSD, PSC produced the biological, enzymatic data; JDR and DR performed phylogenetic studies; ICP, VAV, JDR and DR isolated, preserved and identified fungal strains. All authors read and approved the manuscript.